For just the 2nd time in NBA history the Sixers and Raptors will do battle in the playoffs. Matt Winer, Steve Smith, and Brendan Haywood breakdown the 2nd round series. The Starters preview and predict Raptors-Sixers series: Will Marc Gasol stop Joel Embiid? Can Jimmy Butler slow down Kawhi Leonard? Will the Raptors bench be the X-factor? Joel Embiid puts up 23 points and grabs 13 boards to lead Philadelphia over Brooklyn in Game 5. Joel Embiid scores 31 points with 16 rebounds, seven assists and six blocks versus Brooklyn in Game 4. Selected by the Philadelphia 76ers in the first round (third overall pick) in the 2014 NBA Draft. 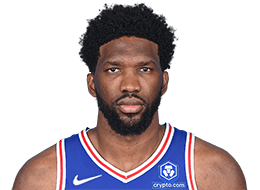 2013-14 Season: Embiid was a second-team Associated Press All-American, a second-team All-Big 12 pick and the Big 12 Defensive Player of the Year in his only season of college basketball.